Left . . . right . . . front & center . . . water, water, everywhere! Settled up high in the bank of Spring Creek sits an incredibly UNIQUE 5 bedroom / 5 bathroom home, divided into 3 private apartments. Be prepared for INCREDIBLE VIEWS of the RUSHING WATERS of a 20-30 foot wide creek and distant views of the only WATERFALL in town from the 2 bedroom apartments. Out the front door, ~7,500 acres of Pisgah NATIONAL FOREST sits just across the road. The sights and sounds of the water are unparalleled with a 90 degree curve of trout-stocked Spring Creek just outside your windows, called Fowler’s Bend. 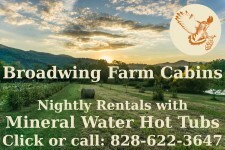 Located less than a 1 minute drive from the center of the town of Hot Springs (8-10 minute paved walk) and under 100 yards walk to the Appalachian Trailhead. You have the proximity to town, but the feel of remote wilderness, and the lullaby of the creek quickly lulls you into deep relaxation.